Last year Walmart took in over $469 BILLION dollars and had a gross profit of over $116 BILLION. They are reporting billions more in profits this year. While billions go from poor and working people into the pockets of the Walmart owners, the “associates” (who do all of the work) get almost nothing. In fact more Walmart workers are on food stamps than the any other company. Walmart is so cheap that many associates are on Medicaid. That is another way that the company transfers its costs to the public while raking in profit. The previous CEO earned in 1 hour what a minimum wage worker makes in 1372 hours. The new CEO gets paid at a level 1,142 times the median employee. And now they plan to give him an even larger compensation. Who owns Walmart – who is profiting off of our community? When stockholders gather for their big party on Friday, June 6, they will see a lot of glitz, and a few celebrities, but they won’t see the faces of those who have to skip meals for lack of money. They won’t feel pain caused by not having money to go to a doctor. They will see America’s richest family the Waltons who have $140 billion among them. They hide a lot of their money in tax-free schemes. Also in their crowd will be the real Walmart movers and shakers—the bankers and financial institutions that control 30 percent of the stock—State Street Corp, BlackRock, Bank of New York Mellon, Bank of America, State Farm, etc. These are the people profiting off of our community dollars and the labor of Walmart workers and their suppliers around the world. Tax breaks for Walmart stores take money out of schools, libraries and local public health programs for our children. Low wages by large employers sends a message to every employer that they can get away with lowering pay and benefits. In effect it sets a sort of cap on wages for many types of jobs which compete with Walmart for workers. Every community that is based on an economy of low wage, no benefit, non-union/no-real-rights jobs is condemned to poverty, deteriorating homes and being dictated to by those outside the community who own the big corporations. Those who have better jobs will tend to see the value of homes decline and will certainly see other community conditions deteriorate. Those who have jobs with a certain level of rights will hear their employer say that they no longer have to provide those rights because Walmart doesn’t. Just as pensions and health care used to be normal features of union contracts, rights of many kinds will go away in a race to the bottom. But it doesn’t have to be that way. Sign petitions, talk to your neighbors, organize meetings to raise awareness of what low wages at Walmart mean to your community. 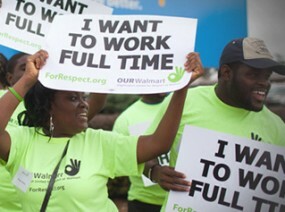 Become a part of the Our Walmart movement to improve conditions.